DJ Mixer Pro for Mac is a powerful, full-featured DJ mixing software for amateur and professional DJs alike, the DJ Mixer for Mac combines an easy-to-use interface makes mixing your music easy. You have 2 decks, an advanced mixer and playlists/database. Complete automatic mixing, beat-matching with a single click, seamless looping, advanced BPM detection, keylock, Compatible with iTunes playlists and lots of effects and many other features. MP3 mixing & DJ mixing software for Mac, automatic mixing and beat-matching. 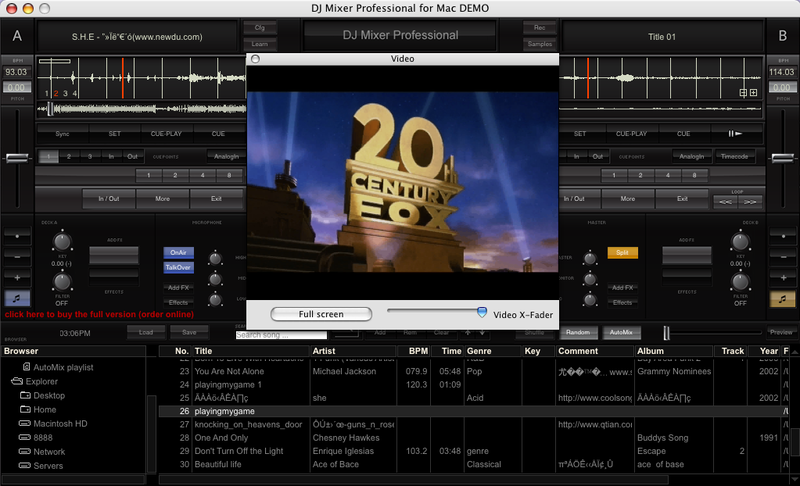 DJ Mixer Pro for Mac supports mix digital music and video in various formats such as MP3, M4A, AIFF, CDA, OGG, WAV, MPEG, AVI, MOV, MKV, MP4, WMV and so on. Complete automatic mixing and manual mixing, beat-matching with a single click, seamless beat-aware looping, advanced BPM detection, keylock (master-tempo), Compatible with iTunes playlists, record your mixes and lots of effects and many other features. You can use external hardware controllers, MIDI controllers, VST/AU effect plugins, sampler. No matter whether you want to use DJ Mixer Software for a professional gig or at a private party or as virtual jukebox in restaurants, hair studios, discos, Night Clubs, and even Retail Stores - DJ Mixer Pro for Mac will prove the right choice! DJ Mixer Pro is available for Windows and Mac OS X. * DJ Mixer for Mac support for Karaoke CDG files (mp3 + cdg files). Qweas is providing links to DJ Mixer Pro for Mac 3 as a courtesy, and makes no representations regarding DJ Mixer Pro for Mac or any other applications or any information related thereto. Any questions, complaints or claims regarding this application DJ Mixer Pro for Mac 3 must be directed to the appropriate software vendor. You may click the publisher link of DJ Mixer Pro for Mac on the top of this page to get more details about the vendor.